I have quickly learned that there are great tools out there as far as medical equipment and assistive devices to help dad. Medicare pays for some and the rest needs to be purchased new, used or borrowed. Since he has only been here 5 weeks, we seem to finally have our act together! Thanks to the nurse, OT, PT and shopping around at the medical supply store, we have what we need for now. All these things make his life (and mine and our help) much easier. Bed alarm: I bought this one and let me tell you – it was my BEST purchase!!! When dad wakes up in the middle of the night, he sits up and this activates the alarm. I also purchased the additional seat alarm – perfect to warn me when he gets up from a nap. He is often too quiet for me to hear him with the baby monitor. 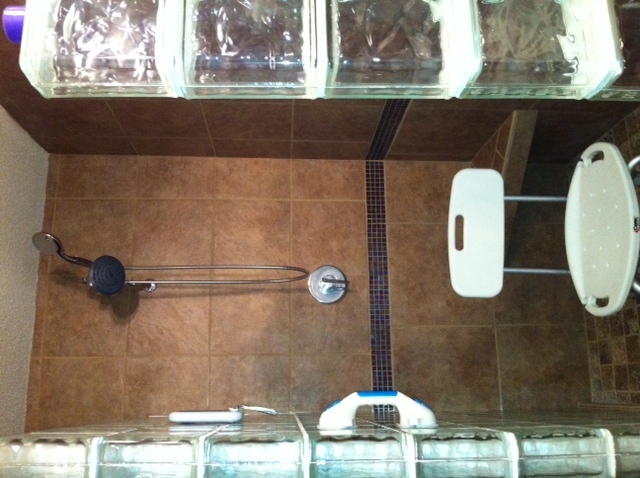 Shower stool, handheld shower and grab bar: You can see that I have a standard shower seat, my husband installed a handheld shower to our nice shower head and we got a very inexpensive suction grab bar that needs to be checked each time but does the trick on our glass block shower. Gait Belt: This is great for transition, safety and saving backs! Step stool with rail: A life-saver for getting in and out of my van. 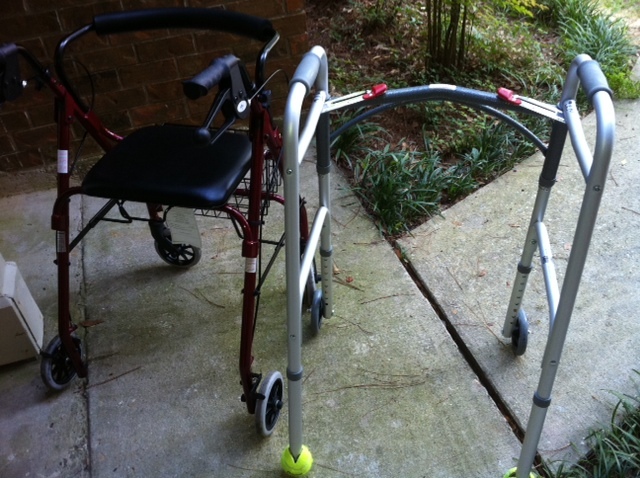 Walkers: We have one for inside and the other mainly for outside. The one with the wheels and basket is easier but tough to manipulate around the doors and halls in the house. He manages to get around nicely in the house with the one with the tennis balls on it. Wheelchair: We are currently using a hand-me-down while waiting for a 16″ Poly-Fly wheelchair with elevated legs and a gel cushion pad. This will be fabulous for our walks and going to doctor’s appointments. 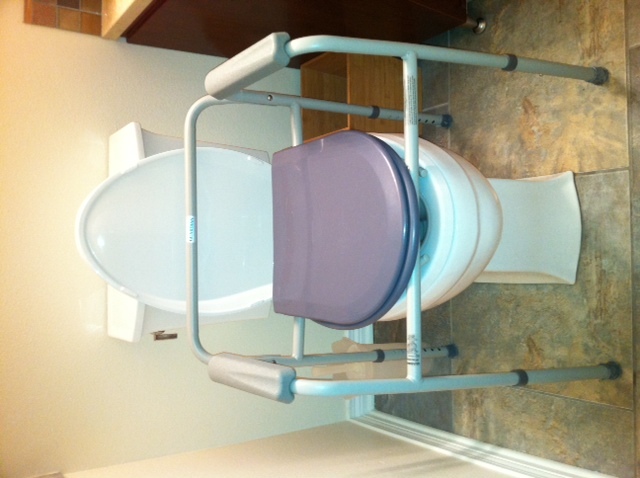 Bedside Commode: Handy at night but also mostly used during the day at our house without the bucket. Hospital Bed: Medicare paid for this and it has made his sleeping much sounder. He can sleep partially elevated and is very comfortable in it. Extra long twin sheets and blankets work perfectly. 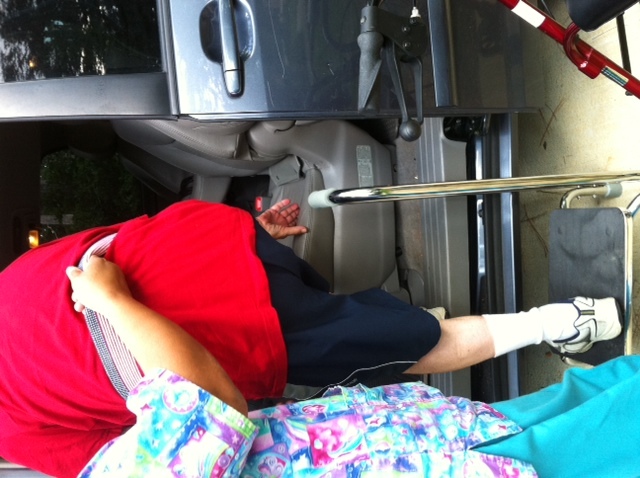 Lift Chair: We have one on order that I bought from a local medical supply store. I think it will be great for snoozing! We ordered model 1153. Transfer Aid: I just bought this one but have not tried it out yet. Makes sense! Baby Monitor: A great thing for backup for me as he is usually fairly quiet when he awakes but I can hear him moving around a bit. Urinal: No brainer!!! But I was pretty clueless the first week so now I know what a lifesaver it is! After reading your article, I remember everything I did to help my dad through this hard ordeal. Nothing is easy when the disease reaches you, but with all the support we can give a loved one, everything goes better for the patient. Course is not all but the patient does not feel alone.